Being in the fitness industry, when I think about fitness devices I think about devices such as step counters, heart rate monitors, and other devices that calculate calories burned and cardiovascular intensity. That is most likely because that is what 99% of fitness devices do. However, there were very few devices, if any, that are capable of tracking weight training performance. 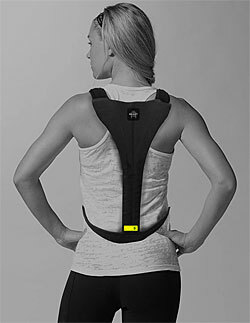 There is an even smaller amount of fitness devices that can tell you how to improve your strength during your workout. Sure you could use other devices to track intensity of a workout or calories burnt during work out, but there is nothing out there as of yet like the Beast Sensor that can give you real-time set-to-set performance assessments to help you maximize your strength goals. The Beast Sensor is a fitness device in a category of its own and is a must for anyone looking to improve their lifting performance. What is the Beast Sensor? 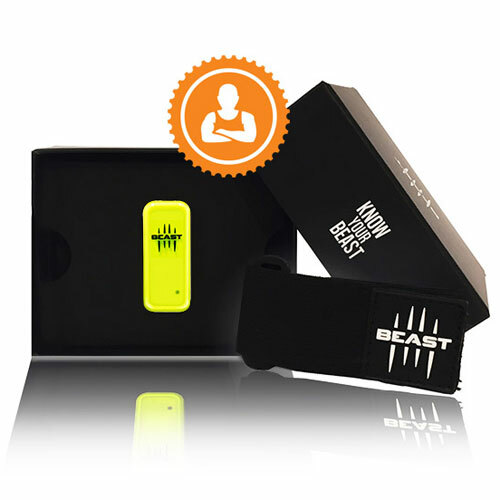 The Beast sensor is a wearable device that collects data such as power output and rep velocity also known as velocity based training (VBT) and gives in-workout feedback designed to help improve your workout based upon your goals. The sensor itself can be worn either on a wristband or directly on the barbell or dumbbell as the sensor is magnetic. Personally, I was not fond of using the sensor on the wristband and I recommend using it on the barbell or dumbbell as I found it to improve the overall accuracy of the device in terms of counting reps. VBT uses target rep speeds or velocities as a feedback tool to dictate how much weight you should be adding or decreasing on a particular set to maximize improvements in strength, size, or power. The target rep velocity zone could be viewed similar to target heart zones when it comes to cardiovascular training. Improvements in vo2 max and cardiac output can be made via training in a particular heart rate zone just like improvements in strength, size, and power can be made by training in a particular rep velocity zone. The advantage of using velocity based training vs. traditional methods like percentage based training lies in the fact that strength or workout performance varies on a daily or even per exercise basis. For instance, on any given day your 1 rep max can vary 10 to 15 pounds simply because of lifestyle factors such as sleep, nutrition, or stress. Having a workout session based upon percentages of your 1 rep max cannot account for a bad day whereas having a workout based upon your average rep velocity per set can account for bad days or even great days. 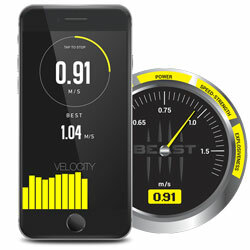 After the completion of each set, the beast sensor app gives you feedback on how to improve your training based upon your average velocity and power output per rep relative to your goal. In addition to real time feedback, the user can plan and save workout in which the data from previous workouts can be used to design or program new workouts. It can also be used during the workout to compare your data from your latest exercise set with the last time you performed that particular exercise set. When selecting exercises to perform through your beast sensor app, you are also given goal setting options: performance tracking, hypertrophy, max strength, and power. With the exception of performance tracking, which is exactly what it sounds like; each goal has a target rep and velocity range to yield maximum results. The sensor is then able to give you post set feedback (increasing, decreasing, or maintain the same weight) based upon your goal and average velocity per rep.
You do not have to be a tech geek to set up the beast sensor as it is relatively easy. As long as you know how to operate a cell phone and a laptop you are good to go. The beast sensor connects to your phone app which allows you to view your progress and track your workouts in real time. On your laptop or cell phone, you can login to the beast web portal where you can view previously saved workouts and design upcoming workouts based upon previous workout performances and goals. The web portal also allows you to view and/or organize past workouts based upon average velocity or power output thus making creating a new workout more user friendly. Overall I had a positive experience using the beast to track and program workouts. As a trainer, bodybuilder, and powerlifter I found multiple applications for the beast sensor. Check out the accompanying video to see me using the Beast Sensor in the gym. While training clients, we could optimize their workout routines by customizing their workouts through velocity and power based training. This is something that can’t be quantified without an advanced piece of technology like the beast. As a bodybuilder, working in the 8-12 rep range can get a little too comfortable at times. However, having the real time feedback from the beast sensor app helps you recognize those sets that need to be more challenging. Thus, giving you the push you need to maximize each set. Being a competitive powerlifter, the beast sensor is a valuable tool in improving strength performance. In addition to hitting a target rep range of 3-5 reps per set, adding the beast to any powerlifting program allows you to set a target velocity or rep speed helping you train your muscles for explosiveness leading to more power and strength. In my experience, there were only two drawbacks to the product. The first was rep accuracy with the wristband, which is easily fixed by attaching the beast directly to the barbell or dumbbell by way of its magnetic capability. The second is the pressing the start and stop button on app which meant putting and pulling my phone in and out of my pocket each set. This may not be a problem or issue for everyone, but it was an inconvenience for me as I would have preferred to have the start and stop button on the sensor itself. On a positive note, the creators of the beast must have heard me before I finished this review because a start and stop button on the sensor itself is in beta testing. Overall this is an excellent product and the first on its kind to bring VBT to fitness market.